The FMG201 Series is a small plastic-bodied magmeter capable of measuring the pulsating flows from air and solenoid-driven metering pumps, the meter is primarily designed for electrically-conductive chemicals and fluids of varying viscosities. The FMG201 electromagnetic flowmeter is an ideal flow measurement device for low flow applications. 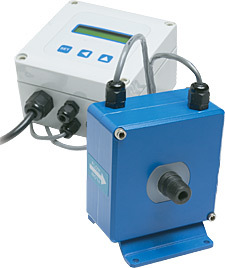 In addition to measuring and displaying flow rate and total flow, this magnetic flow meter unit has a variety of outputs. For continuous transmission of a flow signal, there is a 4 to 20 mA, and 0 to 5 volt signal, and a frequency signal proportional to flow. In addition, there are relay alarm outputs for low and high flows with user-set flow levels. Important Note: For proper operation of this mag meter, one or both of the ground lugs must be well connected to a good earth ground. 10-24 UNC screws used for grounding. Mounting Holes: 4 holes, 0.218" Dia.